Niki de Saint Phalle (1930–2002) was a self-taught artist whose oeuvre is filled with bold, bright colors and joyful figures. Her internationally admired sculptures were created from a multitude of materials resulting in playful contrasts of color and texture. Saint Phalle’s exploration of mythology and themes of femininity challenged conventional societal boundaries, establishing her position amongst the great avant-garde artists of the twentieth century including Jean Tinguely and Yves Klein. Saint Phalle’s strong-willed innovation and insistence on exuberant expression established her lasting legacy amongst twentieth-century artists. 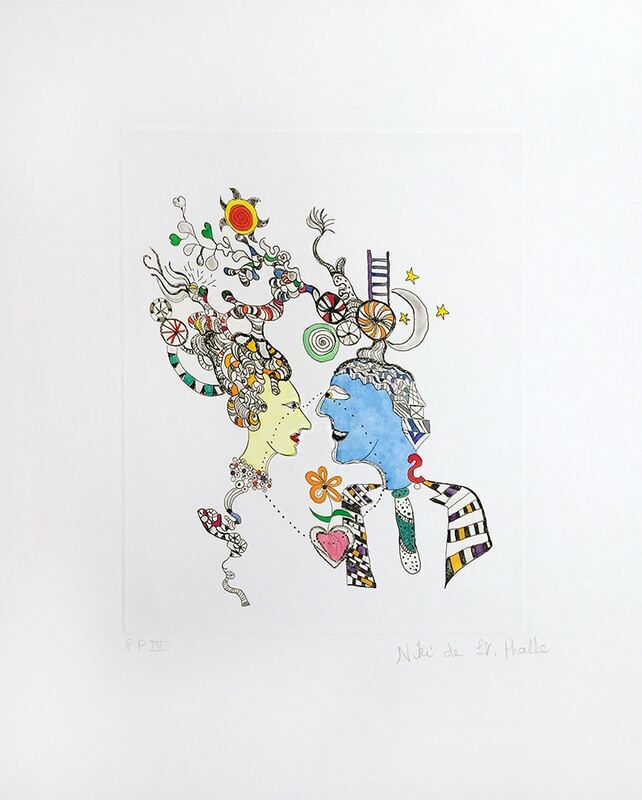 Niki de Saint Phalle was born Catherine Marie-Agnes Fal de Saint Phalle to an aristocratic family of bankers in Neuilly-sur-Seine, France, in 1930. At the age of three, Saint Phalle was sent to live with her grandparents in Nievre due to the 1929 stock market crash. Three years later she was reunited with her family and moved to Greenwich, Connecticut. In 1937, her family moved to New York City. Although she took an early interest in the arts, including poetry and acting, Saint Phalle had difficulty accepting authority throughout her childhood education; she was dismissed from one institution for painting the fig leaves on her school’s statue bright red. In her late teens and twenties, Saint Phalle was a model for several elite fashion companies including Vogue and Harper’s Bazaar. At age nineteen she eloped with Harry Mathews and moved to Massachusetts, where she began to experiment with different artistic media. At age 22, Saint Phalle moved to Paris with her husband to study theater. Mathews became a writer and the two raised their daughter Laura while traveling throughout Europe. However, at age 23, Saint Phalle experienced a nervous breakdown. During her recovery she relied on the therapeutic nature of artistic expression and evaluated how to incorporate it into her life. Upon her return to Paris in 1956, Saint Phalle took inspiration from European modernism including the forms and colors of Paul Klee and Henri Matisse. In Paris, Saint Phalle met sculptor Jean Tinguely and began a relationship that would influence the rest of her career. Saint Phalle’s talent gained acknowledgement in the art world and she held her first solo exhibition in Switzerland the same year. In 1959 Saint Phalle and Harry Mathews separated and she began to focus solely on her art. It was in this period that Saint Phalle encountered the contemporary American art of Jasper Johns, Willem de Kooning, Jackson Pollock, and Robert Rauschenberg at the Musee d’Art Moderne in Paris. By the end of the 1960s she shared a studio with Jean Tinguely and their art became increasingly collaborative. In the early 1960s Saint Phalle began her “shooting” paintings with the use of a rifle as a tool to disperse paint across the canvas. She further developed this method in collaboration with Nouveaux Réaliste artists including Gerard Deschamps and Yves Klein in a group organized by Pierre Restany. Saint Phalle also befriended prominent American artists including Robert Rauschenberg—who purchased a “shooting” painting—as well as Jasper Johns and Larry Rivers. After Marcel Duchamp introduced Saint Phalle and Jean Tinguely to Salvador Dalí, the two created a life-sized exploding bull in honor of the Spanish surrealist. In 1965, after earlier experiments with the mixture of papier-mâché and wool, de Saint Phalle created the first sculpture in her famed Nanas series. In the late 1960s de Saint Phalle and Tinguely completed monumental commissions in international locations including a large-scale Nana called Hon for the Moderna Museet in Stockholm, Sweden and Le Paradis Fantastique for the French Pavilion at Expo’67 in Montréal, commissioned by the French government. This was also a period of extensive exhibiting in the United States for Saint Phalle. However, at the end of 1968, she suffered lung damage from the inhalation of toxic fumes during the creation of a piece involving polyester, which would have long-term effects on her health. In 1971 Saint Phalle and Tinguely married. Extensive travel through Morocco, Egypt, and India during this period informed her practice and expanded her artistic vision. Throughout the early 1970s, Saint Phalle also completed high-profile commissions and created a film called Daddy, which premiered in 1973 at the New York Film Festival. In 1974 she was hospitalized with a lung abscess and spent time in Arizona and the Swiss Alps to convalesce. While recovering, she planned her largest work, a sculpture garden based on the tarot, which would consume her professional life for the next two decades. The 1980s were a productive decade for Saint Phalle including international exhibitions and important progress toward her Tarot sculpture garden. The JGM Galerie and Galerie de France represented Saint Phalle and organized exhibitions dedicated to various stages of her artistic development. Tinguely died in 1991 and de Saint Phalle created a series of sculptures called Meta-Tinguelys in his honor. The following year a major retrospective for Saint Phalle was organized by the Kunst- und Ausstellungshalle in Bonn, Germany and traveled to multiple locations throughout Europe. In 1994 Saint Phalle moved to San Diego, California where she worked on monumental sculpture and silkscreens. Later that year, Saint Phalle received Le Prix Caran d’Ache for her design of the postage stamp Stop AIDS/ Stop SIDA. The following year a film about Saint Phalle was completed called Who is the Monster? You or Me? In 1998 her Tarot sculpture garden was officially opened and two years later the City of Escondido accepted her offer to create a garden that would become Queen Califa’s Magical Circle. In 2000, she was awarded the 12th Praemium Imperiale Prize for Sculpture sponsored by the Japan Art Association, one of the most prestigious awards in the international art community. Niki de Saint Phalle died in California in 2002. The following year The Niki Charitable Art Foundation was established as a non-profit organization in her honor.